Perinatal Stem Cells provides researchers and clinicians with a comprehensive description of the current clinical and pre-clinical applications of stem cells derived from perinatal sources, such as amniotic fluid, placenta and placental membranes, the umbilical cord and Wharton’s jelly. 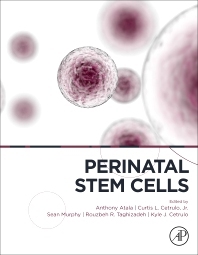 It's compiled by leading experts in the field, offering readers detailed insights into sources of perinatal stem cells and their potential for disease treatment. Therapeutic applications of perinatal stem cells include the treatment of in utero and pregnancy related diseases, cardiac disease, liver disease, pulmonary disease, inflammatory diseases, for hematopoietic regeneration, and for neural protection after stroke or traumatic brain injury.